The Oath as a Jewish Disability. Special form of oath, accompanied by certain ceremonies, which Jews were required to take in courts of law. The disability of a Jew in a contention with a Christian dates back to the Byzantine emperor Justinian, who declared that neither Jews nor heretics should be admitted as witnesses against Christians ("Corpus Juris," c. 21, C. 1, 5; Novellæ, 45, c. 1; Grätz, "Gesch." 2d ed., vi. 18; Stobbe, "Die Juden in Deutschland," pp. 148 et seq.). Secular courts, however, did not recognize it. Thus in the safeconducts issued by the Carlovingian kings in the ninth century (Jew. Encyc. v. 446, s.v. France; vii. 669, s.v. Leibzoll) Jews and Christians are treated as equals, and consequently the testimony of the former, whether given under oath or not, is equal in value to that of the latter (Stobbe, l.c. p. 151). This is distinctly stated in the charter granted by Henry IV. to the Jews of Speyer in 1090. The law of Duke Frederick II. of Austria (1244), which has served as a model for much other legislation on the Jews (see Jew. Encyc. ii. 322, s.v. Austria), merely requires that a Jew shall swear "super Rodal" (by the Torah; Scherer, "Die Rechtsverhältnisse der Juden," p. 182). 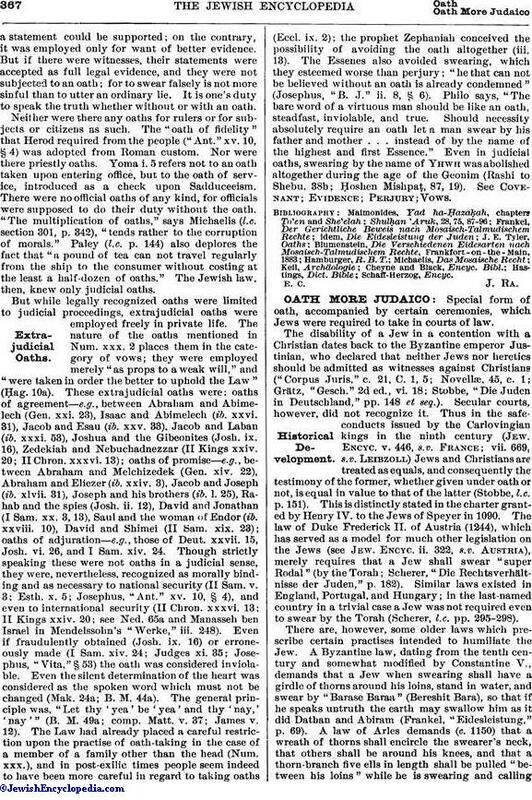 Similar laws existed in England, Portugal, and Hungary; in the last-named country in a trivial case a Jew was not required even to swear by the Torah (Scherer, l.c. pp. 295-298). There are, however, some older laws which prescribe certain practises intended to humiliate the Jew. A Byzantine law, dating from the tenth century and somewhat modified by Constantine V., demands that a Jew when swearing shall have a girdle of thorns around his loins, stand in water, and swear by "Barase Baraa" (Bereshit Bara), so that if he speaks untruth the earth may swallow him as it did Dathan and Abiram (Frankel, "Eidesleistung," p. 69). A law of Arles demands (c. 1150) that a wreath of thorns shall encircle the swearer's neck, that others shall be around his knees, and that a thorn-branch five ells in length shall be pulled "between his loins" while he is swearing and callingdown upon himself all the curses of the Torah (Pertz, "Archiv," vii. 789; Frankel, l.c. pp. 70-72; Stobbe, l.c. p. 155). The "Schwabenspiegel" (i. 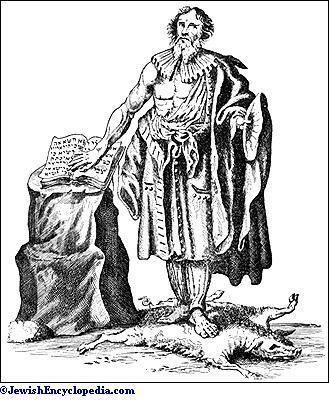 263), a collection of laws dating from the thirteenth century, demands that when swearing the Jew shall stand on a sow's hide; other laws, that he stand bare-footed or that he stand on a bloody lamb's hide; the laws of Silesia (1422) require him to stand on a three-legged stool, pay a fine each time he falls, and lose his case if he falls four times. In Dortmund he was fined each time he halted in repeating the oath. 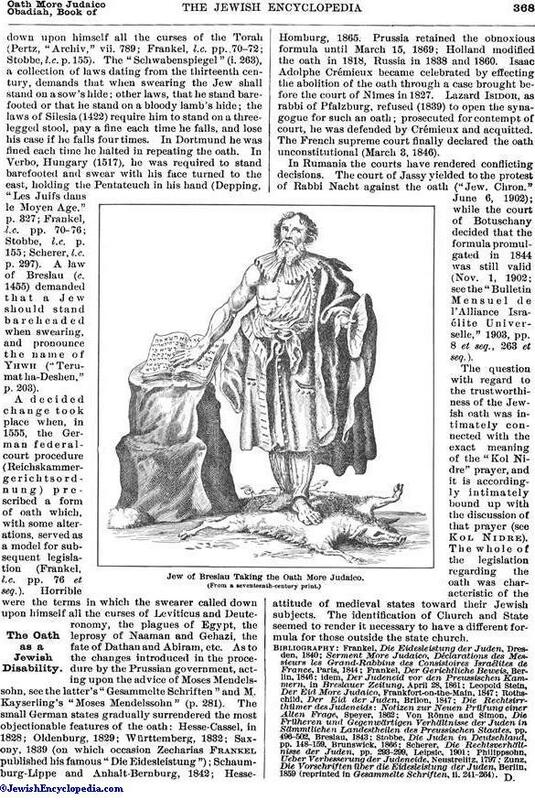 In Verbo, Hungary (1517), he was required to stand barefooted and swear with his face turned to the east, holding the Pentateuch in his hand (Depping, "Les Juifs dans le Moyen Age," p. 327; Frankel, l.c. pp. 70-76; Stobbe, l.c. p. 155; Scherer, l.c. p. 297). A law of Breslau (c. 1455) demanded that a Jew should stand bareheaded when swearing, and pronounce the name of Yhwh ("Terumat ha-Deshen," p. 203). A decided change took place when, in 1555, the German federal-court procedure (Reichskammergerichtsordnung) prescribed a form of oath which, with some alterations, served as a model for subsequent legislation (Frankel, l.c. pp. 76 et seq.). Horrible were the terms in which the swearer called down upon himself all the curses of Leviticus and Deuteronomy, the plagues of Egypt, the leprosy of Naaman and Gehazi, the fate of Dathan and Abiram, etc. As to the changes introduced in the procedure by the Prussian government, acting upon the advice of Moses Mendelssohn, see the latter's "Gesammelte Schriften" and M. Kayserling's "Moses Mendelssohn" (p. 281). The small German states gradually surrendered the most objectionable features of the oath: Hesse-Cassel, in 1828; Oldenburg, 1829; Württemberg, 1832; Saxony, 1839 (on which occasion Zecharias Frankel published his famous "Die Eidesleistung"); Schaumburg-Lippe and Anhalt-Bernburg, 1842; Hesse-Homburg, 1865. Prussia retained the obnoxious formula until March 15, 1869; Holland modified the oath in 1818, Russia in 1838 and 1860. Isaac Adolphe Crémieux became celebrated by effecting the abolition of the oath through a case brought before the court of Nîmes in 1827. Lazard Isidor, as rabbi of Pfalzburg, refused (1839) to open the synagogue for such an oath; prosecuted for contempt of court, he was defended by Crémieux and acquitted. The French supreme court finally declared the oath unconstitutional (March 3, 1846). In Rumania the courts have rendered conflicting decisions. The court of Jassy yielded to the protest of Rabbi Nacht against the oath ("Jew. Chron." June 6, 1902); while the court of Botuschany decided that the formula promulgated in 1844 was still valid (Nov. 1, 1902; see the "Bulletin Mensuel de l'Alliance Israélite Universelle," 1903, pp. 8 et seq., 263 et seq.). The question with regard to the trustworthiness of the Jewish oath was intimately connected with the exact meaning of the "Kol Nidre" prayer, and it is accordingly intimately bound up with the discussion of that prayer (see Kol Nidre). The whole of the legislation regarding the oath was characteristic of the attitude of medieval states toward their Jewish subjects. The identification of Church and State seemed to render it necessary to have a different formula for those outside the state church. Jew of Breslau Taking the Oath More Judaico. Zunz, Die Vorschriften über die Eidesleistung der Juden, Berlin, 1859 (reprinted in Gesammelte Schriften, ii. 241-264).